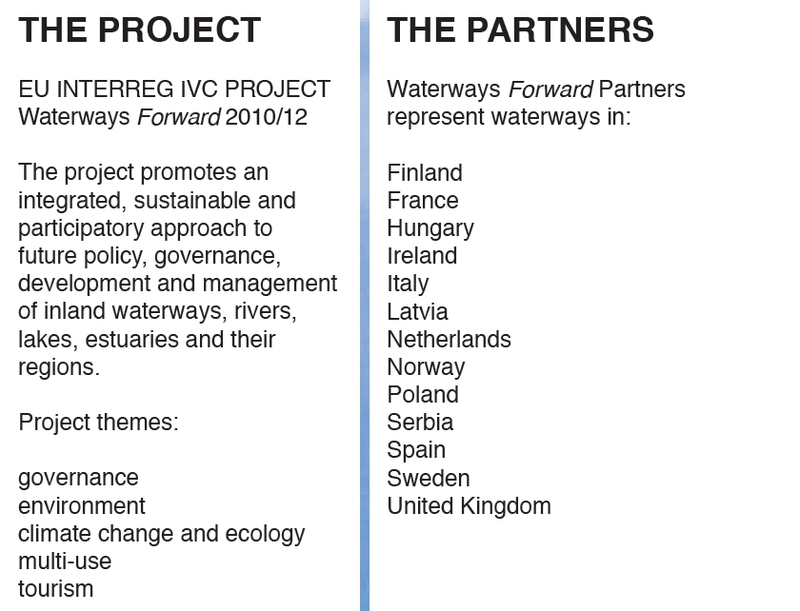 Waterways Forward blog | News and information from the Waterways Forward project – an EU Interreg IVC programme project. Waterways Forward project partner Claudio Repossi of Navigli Lombardi S.c.a.r.l. was interviewed by Landscape Interface Studio, Kingston University during the partners’ meeting held in Budapest in January 2012. Here Claudio described the work being carried out in Milan by Navigli Lombardi S.c.a.r.l. to develop the canal network in advance of Expo 2015 and how this partner is working with local municipalities and communities to support future plans for regeneration of their canal system. Claudio discusses the importance of taking part in a pan-European project and the benefits of working closely with other partners to gain insight into their good practices and management styles. He describes the close relationship between the local Lombardy landscape and the canal system plus the strong links with the canal system’s heritage which are key to developing its future potential. Waterways Forward project partner, South Tipperary’s Heritage Officer describes development of the River Suir Action Plan as the main output from their participation in the Interreg IVC project. Labhaoise McKenna explains how stakeholder and community engagement supported development of the plan. Starting with an analysis of existing strategies the potential and opportunities of the local area were reviewed and weaknesses and strengths identified. This was then further developed by running a series of locally based community workshops. In addition, 2 seminars were held where local interest groups, stakeholders, land-owners and local authority representatives described their involvement and outlined needs and wishes for the River Suir Action Plan. South Tipperary County Council have now identified some strands of funding to support the Plan’s roll-out and with the support of a new European Regional Development Funded project, “Blue and Green Futures” it is hoped that the River Suir Action Plan will be further developed over the next year. Italy’s Trieste Port Authority (APT) is taking part in the ‘Upgrading of inland waterways and sea ports’ (INWAPO) European project in a bid to boost freight traffic. The INWAPO is implemented through the Central Europe 2007 to 2013 programme, funded by the European Regional Development Fund. It includes an analysis of potential volume of traffic, the identification of existing infrastructure and a feasibility study to improve links with logistics centres. Other ports involved include the ports of Venice, Koper, Budapest, Vienna, Bratislava, Sturovo, Komarno and Czech and Polish ports north of the Baltic Sea. 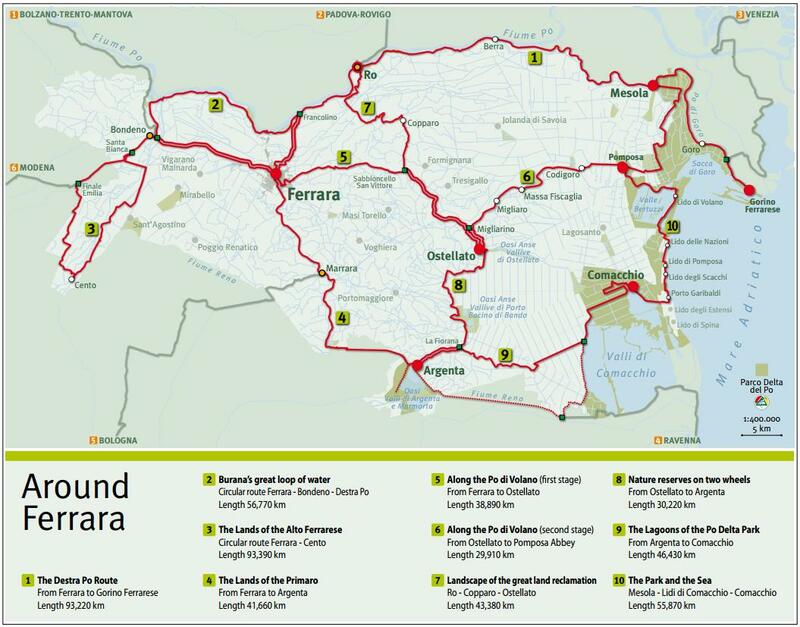 The Italian city of Ferrara, capital of the province of Emilia Romagna, partner in the Interreg IVC ‘Waterways Forward’ project, is keen to develop cycling as a way of promoting the use of Europe’s waterways marketing cycling as a tourism tool, encouraging sustainable transport and delivering well being for its citizens. It is a cycling city par excellence. Four out of ten trips are made by bicycle, and the bicycle is used by all social groups, by people of all age groups, by men and women, boys and girls, for all purposes, all over the year. Citizens of Ferrara say, that little children get their first bicycle before they have learned to walk. With this high share of cycling, Ferrara is not only by far Italy’s cycling city number one. It is also among the best cycling cities in Europe. 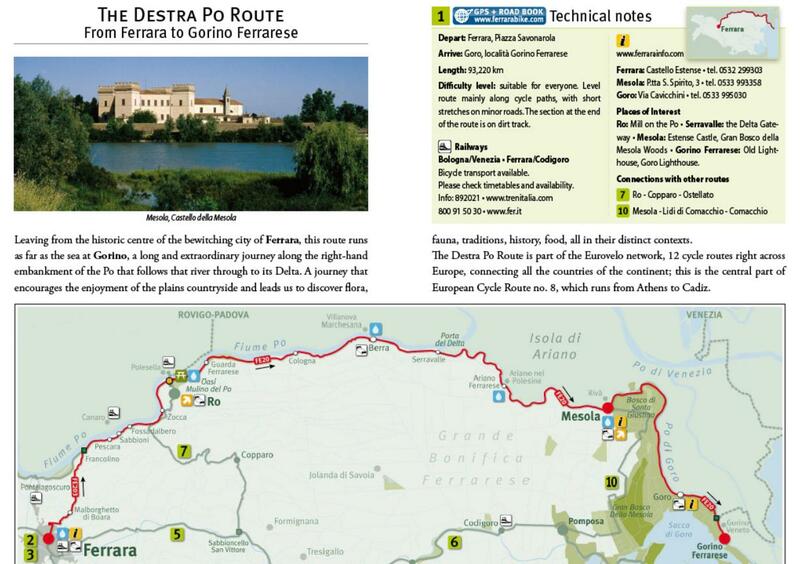 This is the map of the most famous cycle path in the province of Ferrara. It’s part of the Eurovelo project and it is the central part of Paneuropean route No.8 from Athens to Cadiz. Destra Po route runs along the right-hand bank of the River Po. to know the beauties of the Este& rsquo s capital, like its green walls, Este castle, medieval city and cathedral, and the Renaissance city centered on the Palazzo dei Diamanti. an impressive network of interconnected cycle tourism routes, unwinding between town and countryside, nature reserves and castles, watercourses and lagoons, on safe roads or cycle-only paths. 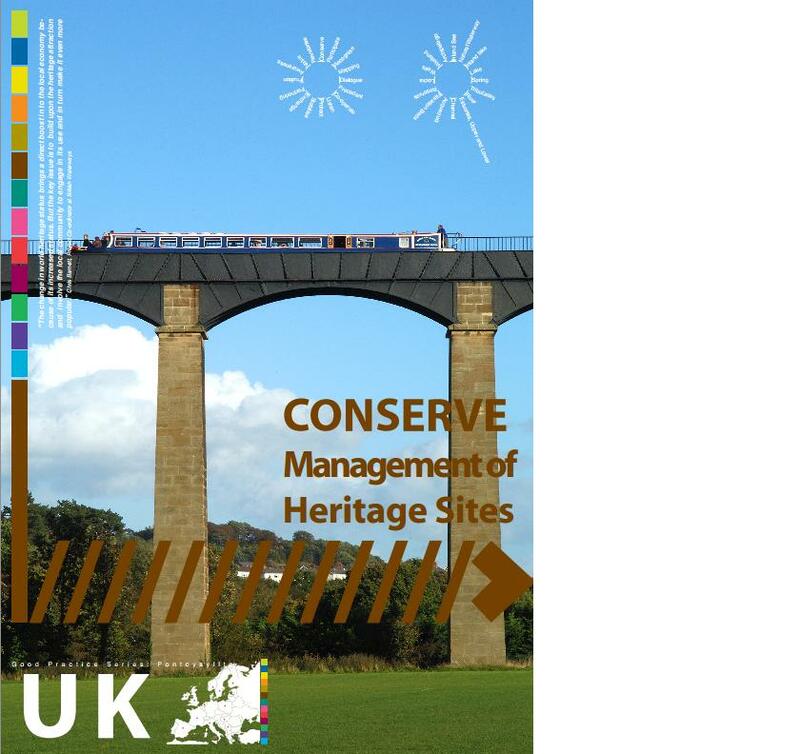 Waterways Forward partner Canal & River Trust (Formerly British Waterways) has worked with local communities to develop the World Heritage Status of the Pontcysyllte Aqueduct. The site consists of a 206 year old aqueduct and an 18km corridor of the Llangollen canal lying adjacent to it. The aqueduct is one of the most significant engineering structures on the British canal system. The corridor contains a wide range of historic canal-related structures and buildings, including tunnels, cuttings, wharves, houses, water control structures and a second major historic aqueduct at nearby Chirk. UNESCO World Heritage Site status was applied for in 2005, on the 200th year anniversary of the completion of the aqueduct. The application was successful and in 2009 the status was granted. The application process and successful achievement of status has had beneficial results. Rather than just securing the waterway’s heritage, it has led to the development of tourism in the area as well as giving voice to the local communities who have expressed an interest in becoming involved in the management of the WHS. A community development project has been established to bring together 11 communities along the 18 km canal corridor. This is coordinated by a community project officer. It focuses on facilitating an understanding and greater awareness of the heritage, culture and biodiversity of the canal and its corridor and encourages participation in its environmental conservation, including capacity building in conservation skills. The overall outcome is that the potential for these type of developments to occur across other heritage waterway sites through the achievement of WHS status has been understood, and so may be applied to other sites in the future. Valuation estimates are generally not linked with changes in water management practices. This is of particular significance for decision makers, since without this they are unable to fully compare the consequences of alternative practices and actions. Also, water-quality services are diverse and range from quality of drinking water to commercial fisheries or recreation. Therefore any valuation tool omitting these factors could underestimate the true service value, and neglect possible trade-offs. Finally, economic and biophysical models are often not well integrated. For example, where a biophysical model may measure phosphorus concentrations, an economic model may include data on the amount of money the public are willing to pay for enjoyment of a clean lake, which cannot be easily and accurately related to the levels of phosphorus. 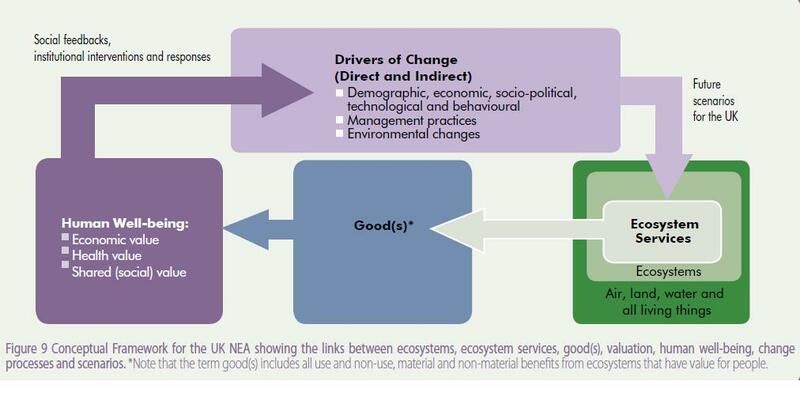 Links between ecosystems, ecosystem services, good(s), valuation, human well-being, change processes and scenarios. The new three-stage valuation framework proposed in this study can be applied to both inland water bodies such as lakes and streams but also coastal bays and ocean beaches, by using relevant data relating to different conditions and services. In the first stage, biophysical models link changes in management with the change in water quality, for example, in terms of pollutant concentrations. The second stage relates the change in water quality to the ultimate effects on ecosystem goods or services, such as the frequency of beach closures or the toxicity of algal blooms. The final stage translates the changes in such goods or services to changes in economic value. At each stage, the researchers strongly recommend that the models take into account the interactions between changes in water quality and the multiple ecosystem services provided. For example, levels of phosphorus can influence both water clarity and abundance of fish and these factors in turn will affect the ultimate value of lake fishing, swimming and viewing nature. For effective use of the framework, the researchers recommend that users first identify the beneficiaries of interest (e.g. commercial fishing companies and swimmers) and the valued attributes (e.g. high fish abundance and low water toxicity) and then ensure that the most appropriate biophysical and economic models are chosen. For example, a biophysical model specific to groundwater is needed to assess levels of nitrates in wells. The study does highlight that extensive data, which may be difficult to obtain, are needed for their proposed framework. However, a key advantage of this approach is that it enables uncertainties, including estimates based on small amounts of data, to be identified and taken into account. Source: Keeler, B. L., Polasky, S., Braumana, K. A. et al. (2012). Linking water quality and well-being for improved assessment and valuation of ecosystem services. Proceedings of the National Academy of Sciences. 109 (45): 18619-18624. Although not a European site this workshop could throw up some design solutions appropriate for European waterfront regeneration. The project has been initiated by the MA Landscape & Urbanism and PG Diploma Landscape Architecture programmes in the Faculty of Art, Design and Architecture at Kingston University. What are the unique conditions and relations between these great cities? How can the potential of these conditions and relations be transformed into site specific design proposals? Previously, students and staff spent 5 days in Liverpool and attended presentations from Waterways Forward partner, Canal & River Trust, on the regeneration work they have carried out at the Liverpool Waterfront. 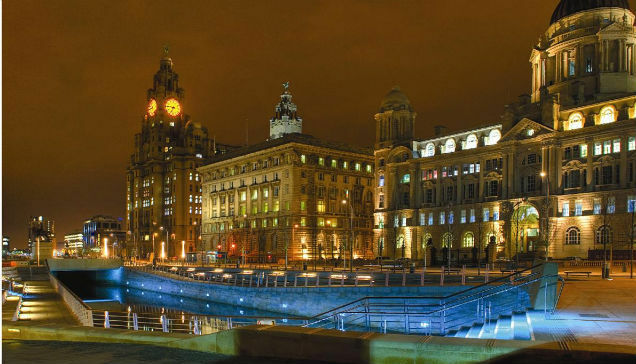 Liverpools Waterfront has been transformed in the last 10 years. The Canal & River Trust has played it part in the regeneration of Liverpool’s Waterfront through the delivery of the Liverpool Canal Link, a new canal which runs through the waterfront, this new canal is now the centre piece for the Pier Head and the new public realm has established the Waterfront as Liverpool’s key tourist destination. Kingston University present a workshop for their design and research collaboration Liverpool New York. 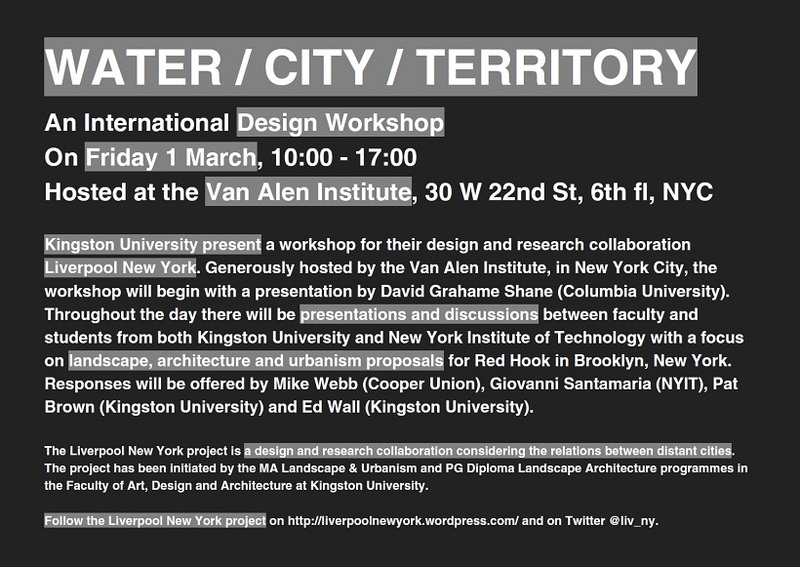 Generously hosted by the Van Alen Institute, in New York City, the workshop will begin with a presentation by David Grahame Shane (Columbia University). Throughout the day there will be presentations and discussions between faculty and students from both Kingston University and New York Institute of Technology with a focus on landscape, architecture and urbanism proposals for Red Hook in Brooklyn, New York. Responses will be offered by Mike Webb (Cooper Union), Giovanni Santamaria (NYIT), Pat Brown (Kingston University) and Ed Wall (Kingston University). 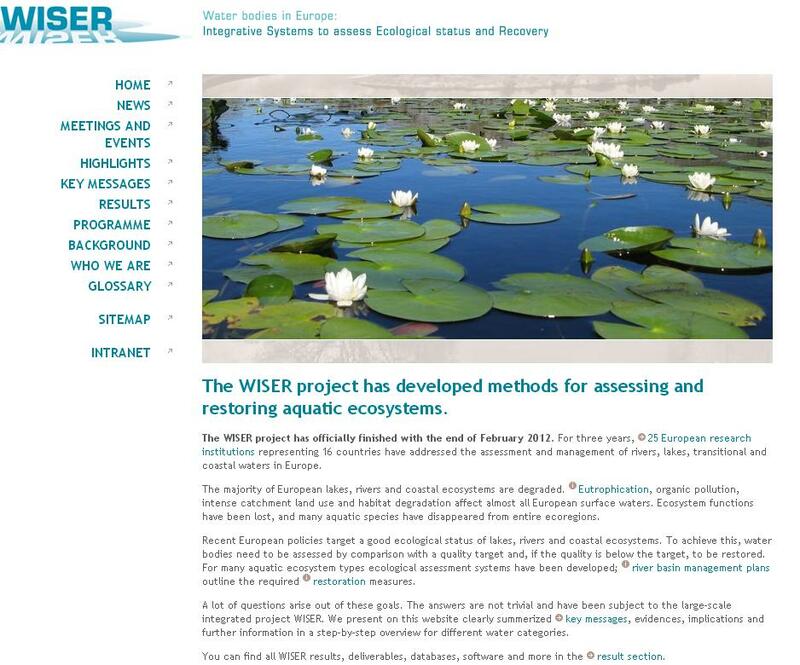 EU Wiser Project has developed new methods for assessing and restoring aquatic ecosystems and solutions to make rivers and lakes cleaner, safer and more sustainable. For three years, 25 European research institutions representing 16 countries have addressed the assessment and management of rivers, lakes, transitional and coastal waters in Europe. The majority of European lakes, rivers and coastal ecosystems are degraded. Eutrophication, organic pollution, intense catchment land use and habitat degradation affect almost all European surface waters. Ecosystem functions have been lost, and many aquatic species have disappeared from entire eco-regions. Recent European policies target a good ecological status of lakes, rivers and coastal ecosystems. To achieve this, water bodies need to be assessed by comparison with a quality target and, if the quality is below the target, to be restored. For many aquatic ecosystem types ecological assessment systems have been developed; river basin management plans outline the required restoration measures. 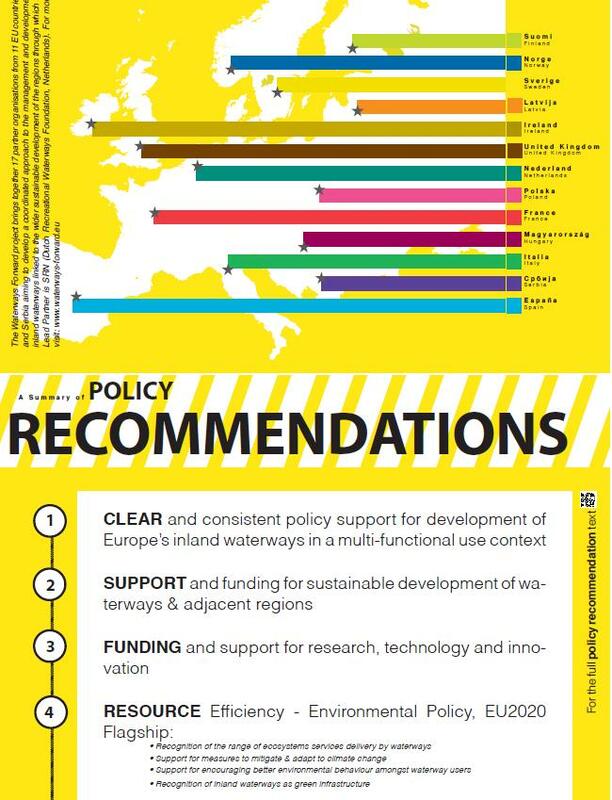 Waterways Forward partners gathered in Brussels in December ’12 to engage in some direct’ lobbying’ of EU officials. The December event was an important two way exchange. WF partners spoke of achievements and strength of the waterways case. To support their discussion the project’s Final Policy Recommendations – developed and designed by Landscape Interface Studio (LIS), Kingston University – were presented during the meeting. Jean-Marc Venineaux, the EC’s Directorate General for Regional Policy at the European Commission and Cesare Bernabei (DG Energy and Transport) outlined the Commission’s approach to future funding for Inland Waterways. Jean-Marc Venineaux said that 5.98% of the €11.7 billion budget will be for co-operation projects (Interreg etc) and that they expect “improved co-ordination between EU funds”. WF partners argued the multifunctional nature of waterways means we have the capabilities to do exactly this. 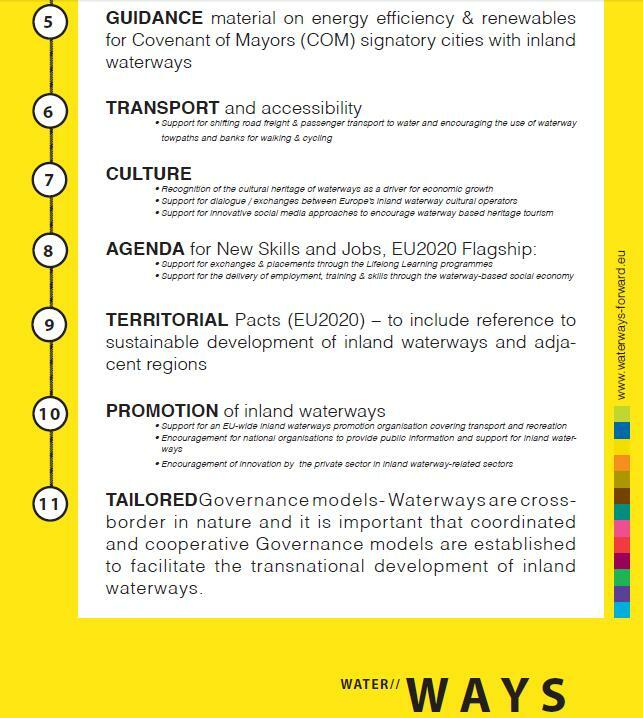 However none of the 11 Thematic Objectives (for funding) relate specifically to waterways. Because of this, Rob van Eijkeren from the House of the Dutch Provinces advised the partners to lobby hard for inclusion of waterways in their funding programmes. Waterways Forward held its Final Conference in Paris on 7-8 November 2012. 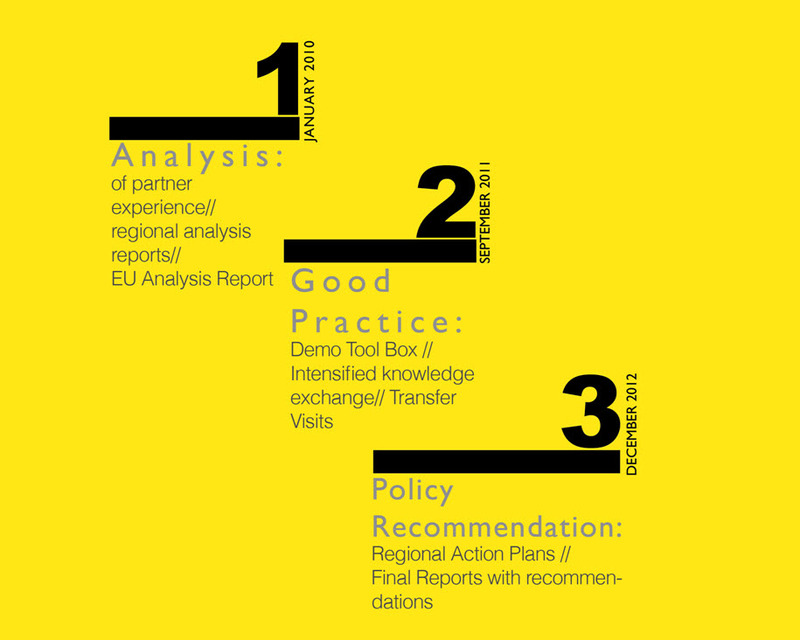 Delegates heard about the work carried out in the project to produce a set of policy recommendations that it’s hoped will be taken forward by EU policy makers. The recommendations cover a range of waterway management topics developed through a number of meetings, workshops, seminars, and stakeholder events to draw out the key issues. The Conference also reviewed progress and achievements of the project, including Regional Analyses of waterways in partner regions, the identification of good practices, and the development of Regional Action Plans, which provide the basis for real implementation of improvements at a partner level. Presenters spoke of the potential of inland waterways to support economic growth, regeneration, the green economy, and river cruise activity. 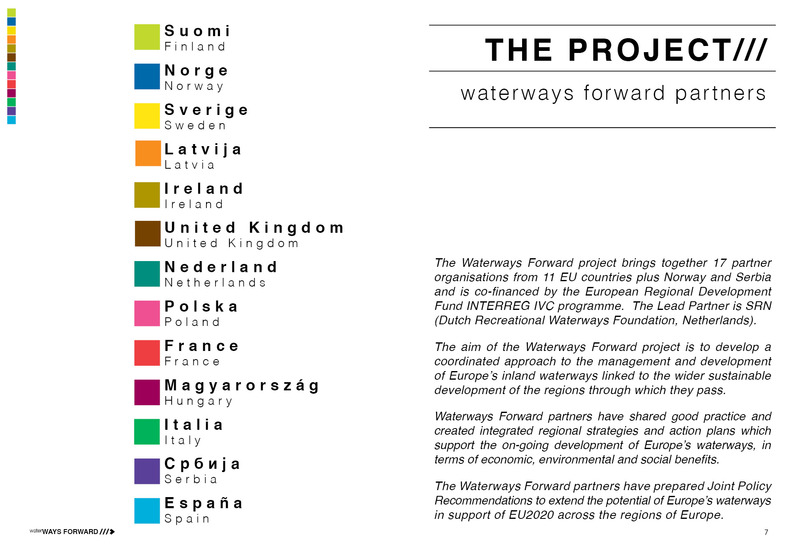 Looking ahead, partners hope to achieve greater recognition amongst European, national and regional institutions of the multi-functional role of navigable inland waterways in promoting regional economic development to support delivery of the Europe 2020 strategy. 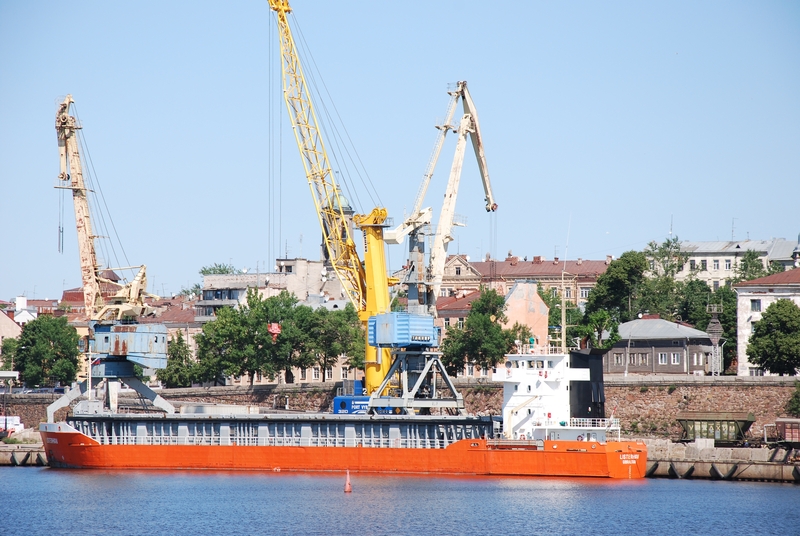 In addition the partnership hopes to secure support and funding for the development of inland waterways in a multi-functional use context under the new EU policies and programmes for the period 2014 – 2020. One way of achieving this is through continuation of the WF partnership after the end of 2012 to facilitate the sharing of good practices, the joint development of innovative new approaches, and the promotion of the multi-functionality of inland waterways.